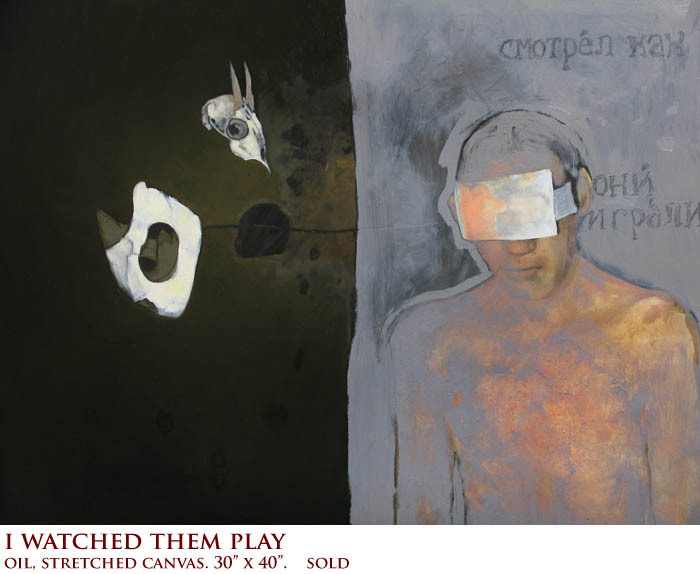 When I first encountered the painting, We Are Made A Spectacle Unto the Earth, by American artist Caitlin Karolczak, I saw a fine example of an artist whose intention and mode of expression were pulling no punches. 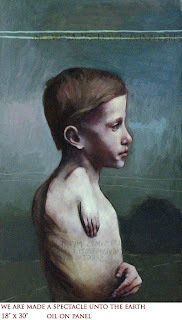 The lone figure of a naked child in profile stares out and announces his presence with a quiet yet uncertain resolve. The ‘abnormal’ and estranged quality of his body is only partially explained by his diminutive limb; it is felt through the fall of light over it, and the oppressively dark terrain in the distance. Studying this work I feel a palpable sense of incompleteness; a sense that what lends this painting so much of its resonance is what is left unspoken and unresolved. Caitlin Karolczak was born 1984 in northern Minnesota. She received a BFA in Fine Arts and BA in Art History at the University of Minnesota Twin Cities in May of 2005. 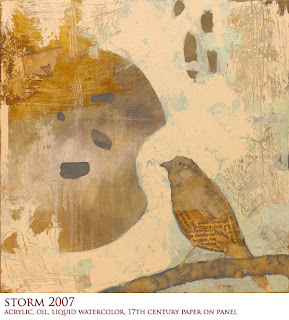 She currently resides in Minneapolis Minnesota working as a self-employed artist and co-gallery owner. I caught up with Caitlin recently to find out more..
[Paul R] Alongside your fine art degree you have a BA in Art History. Was there are particular aspect of art history you feel has significantly influenced your own direction as an artist? [Caitlin Karolczak] My paintings draw upon many aspects of art history, and while my studies in college were mostly concentrated in medieval and early Christan art, I’m influenced by several different styles and time periods. I’ve tried many different techniques and I never stick with just one. Right now I’m particularly interested in the strange themes and settings of Early Flemish painting. I want to mirror the atmosphere and quality of these paintings while employing some modern techniques and abstractions. [PR] Is there any thing specific to your background/cultural heritage that you feel has contributed directly or indirectly on you art? [CK] I would have to say that my cultural background has had an indirect influence on my art, or maybe my lack of cultural heritage has had a direct effect. Ethnically I’m many things – Polish, Irish, Scottish, French, English, Lakota (Native American) and more. I think my mixed race / immigrant background hasn’t allowed me to really connect with any one heritage beyond being raised American. [PR] Caitlin, I was intrigued to learn more about the themes you tackle in your work…Can you explain the specific origin and motivation behind your interest in fragility, disease or injury? Why do you think it is important to bring this to our attention in painting? [CK] While I can’t pin point any specific origin in my interest of the fragility of the human body, there are many reasons why I’m drawn to this theme. I’ve been working with these ideas for a long time and they probably initially stemmed from an interest in early art themes, which oftentimes depict violent events, like martyrdom or the crucifixion, but that also contain a recurring idea of art as memorial. I think several of my paintings are a combination of these ideas as well as an interest in medical illustrations and photographs. I think I’ve always been compelled to make the viewer want to look at a painting of something that they normally wouldn’t want to look at. I feel that a painting needs to be intriguing or at least stimulate some sort of question or feeling in the viewer. I like the challenge of making something ugly beautiful. Recent events in my life have caused me to become more aware of mortality. I spent a lot of time in hospitals with a close friend who was diagnosed with an aggressive and terminal cancer. I found many of our notions about sickness and death confusing and I think it has become important for me to address some of these issues in my art. Many people are quick to label my art as morbid or depressing but I think that they do appeal to many individuals who understand or appreciate their layered meaning. On first impression it’s easy to misunderstand my intentions, but my paintings are meditations on life and are often about the determination of the human spirit. [PR] You work also includes Still life and Animals, which suggests your concerns spill over into other aspects of our human experience and interaction with things living and inanimate. Do you approach your still life/animal paintings more as studies or do they seek to address similar concerns as those involving people? [PR] You seem very attuned to the qualities inherent in antique or aged materials – what is it about them that makes them important to you and to your art making process? [CK] It has a lot to do with quality and texture. They don’t make art supplies, paper, or fabric like they used to. I own a gallery that specializes in vintage furnishings, art and fine antiques. So, because of my day job I get my hands on all sorts of interesting vintage supplies, whether is fabric, paint, or powders. Not only are these materials unique, they are usually very cost effective compared to buying new supplies. Aged materials add another dimension and for me they seem to require a higher standard of painting to be in unison with each other. [PR] Some of your work is quite layered and dense with textures, and you have said this can ‘add distinction to a finished painting’. Why is this surface quality so important to you? [CK] For one of my paintings to be successful, it needs a lot of time and paint, even if they are translucent layers. I’ve found experimentation with different mediums to be extremely important – to learn how to use uncontrollable changes in paint to your advantage. If you study paintings in museums you see that the artist has used a lot of different techniques and washes to create different illusions. [PR] Art history has often polarized ‘abstract’ from ‘figurative’ modes of working. Yet in your work there they seem to co-exist in support of each other. I know some artists really struggle with this… was this your initial experience or does the work end up this way quite intuitively? [CK] I think my work ended up this way intuitively. My earliest paintings / drawings were simply studies. 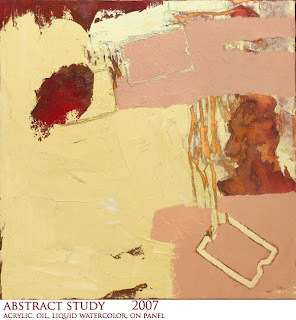 As I began to hone basic drawing and painting skills, abstraction was a natural progression. I think a lot of people struggle with mixing abstraction and figurative work because they try to work in an abstract way before they learn the basics. At least this was my experience in college – figurative work was often discouraged, treated as a dead art form, and I think a lot of students suffered from it – not learning basic techniques while creating unsuccessful abstracts paired with a written explanation. I think it takes an obsessive amount of practice to teach oneself these techniques and that some students are taught to use abstraction as a short-cut instead of a culmination. [PR] The freedom and ability to network on line is not only getting easier for artists, but it could be argued it’s also more important than ever? Do you agree with this? Are there any specific art networks, online influences or communities that have worked really well for you? [CK] I think its very important for emerging artists to have an online presence. Most worth while galleries are totally unapproachable. There is a flood of mediocre artists working today and gallery owners have become so overwhelmed by this constant stream of emails and letters that they oftentimes won’t look at anyone’s unsolicited portfolio. Having an online presence or recognition in online art competitions can help make the right connections that one needs in the real world. Granted that most of the acknowledgment one gets online comes from other artists, this is still very beneficial. I’m seeing more artists having successful shows without the help of galleries and or being put in contact with galleries through artists met online who are already represented by that particular gallery. I’ve had international sales and I’ve been invited to participate in shows due to my involvement online. Its easy to get lost in these huge online communities and some can be a bother to keep up with, but I have to admit that they’ve been worthwhile for myself, especially when I had no other opportunities. Some of the networks that worked well for me are artmesh.org, myartspace.com, and MNartists.org. Other ones that created contacts, but that seem to go in and out of popularity and usability are Saatchi online, talentdatabase.com, artslant.com. [PR] You seem very focused for an artist in their mid-twenties. Do you have any specific travel or career related goals as an artist you would like to share with us? [CK] I don’t have any terribly specific plans for the future because I don’t want to be too disappointed if I don’t reach those goals, although I hope I will experience a reasonable amount of success as an artist in the next 5-10 years. I have a lot to learn about painting and my biggest goal is to mature in technique and approach. Owning my own gallery / being self employed doesn’t leave much opportunity for long-term travel but I would love to do an artist’s residency in Japan or Europe someday. I have a show in October in New York and I hope it could be a stepping stone to exhibit there more often. I want to eventually show in London and other parts of Europe. I’ve sold paintings to people there and I think that area is a lot more receptive to my work rather then the Midwest US. [PR] And what advice do you have for young or emerging artists who are thinking about a life in art or who are struggling to make that leap from a more conventional ‘position’ in life? [CK] I would advise young artists to be realistic and to be prepared for plenty of criticism. I think a lot of people in the creative community think being an artist is a glamorous life but it’s anything but. I wouldn’t recommend anyone to quit their day job in pursuit of being an artist unless they’ve experienced some financial success with their art and have somewhat of a reputation. If the art you WANT to create is not solely paying your bills, then don’t try to make it a full time thing right away. I know artists that take a lot of pride in not having a day job, but their art oftentimes suffers from the move. They now spend most of their time producing cheaply priced paintings of commercial subject matter – people’s dogs, flowers, fruit – to make ends meet. Personally, I work part to full time depending on that week’s work load and then paint what I want part to full time. If I lived meagerly I could probably get away with painting full time but I think the financial stress would have an adverse effect on my art and consequently limit some of my creative freedom. [PR] Great advice. Finally, do you have any current or upcoming projects that you can let us in on….perhaps a sneak peek at some new work or new things growing in your studio? [CK] I have several paintings going on right now, and I have to admit I’m not too terribly inspired by any of it at the moment (most of my paintings go through a frustrating stage..). I may have to start something new and fresh. I recently got my hands on some stunning antique medical books about hermaphrodites. They contain a lot of strange and beautiful images and I think it might inspire a new series of paintings. [PR] Thanks for your time Caitlin.